At Tokyo Game Show '18 during the Capcom Pro Tour Japan Premier, Yoshinori Ono took the stage to announce an actual arcade version of Street Fighter V: Arcade Edition - which will arrive in Japanese arcades sometime in 2019. 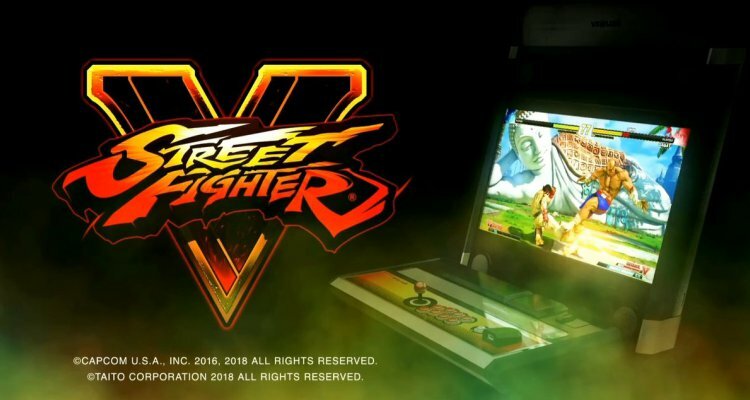 The SFV arcade cabinet will use new Vewlix hardware and feature a USB port on either side so players can use their own gamepads or fightsticks. The first location test for the arcade version is set for October 5th-7th 2018 at select Japanese arcades. Which one came worse before the other in input lags - The controllers wired to hardware or usb controllers you connect to the hardware? Not even Exa Arcadia would ever consider that option because Exa Arcadia really cares for a lag-free experience. Why on Earth would you think that hooking up an external controller would somehow introduce input lag? The reason for this addition is two-fold: You have younger players who prefer to play on pads (or just pad players in general), and you also have other players who prefer to play on their own equipment for various reasons (can't blame bad levers/buttons for your loss, you're Korean and you prefer Korean parts, you're a cheater with a Hitbox, etc.). This move is catering to the competitive scene. I'm all for USB ports. The amount of whining over controls in a competitive scene is probably unbearable. I know I've heard my fair share of it. Is this going to be a new member of the Vewlix family, or just a new CP? The picture looks like a Black Diamond + CP. We will see. I would be surprised. The panel is a regular orange 1L6B with additional usb connector. You're right about it being boring. I imagine this is an attempt to pump some more money out of SFV, especially using usb as a draw. i wonder if it is even running on a Type-X board or if it is just a regular pc, also interessting is the 1L8B Panel layout. It does look really, really stupid though. I hope Hori makes a line of sticks that look like the SFV Vewlix panel. I agree the CPs and units look awful in orange (sorry HL2 fans)... but the the screens look super sharp and vibrant to me, it might just be the camera...but I wonder if its a new model monitor, 4K HDR anyone?? as old school (and old) as I consider myself, i'm all for adding controller ports to these modern machines. some of the very best sfv players use pad these days (menard, smug, knuckledu) and there's nothing wrong with that at all.. after all these kids grew up after the decline of arcades, on ps3's and ps4's. as for lag there is this huge misconception going around that sfv is a laggy game. it was when it was released but currently sits at about 4.5 frames, which puts it on a par with third strike arcade version. modern arcade machines are mostly pc-based and so usb controllers have negligible impact on input lag. Im sure that keypad is a pay to win like all games these days ! Dia Black and Dia Black Orange have a 1080p Screen. For some reason Capcom is going to release a patch on the 23rd (for consoles) that is supposed to fix an issue with input registering speed. Maybe it's because the game still feels laggy? There has been a long-standing issue with consistent input latency during gameplay that has caused a number of complaints from the competitive scene. SfV is a terrible game that doesn’t deserve to hold the street fighter title. The usb controller inputs make sense. Though I’ve been around competitive sf enough to know that, unfortunately, it will do virtually nothing to stop complaints. Some (western) players will just blame the pcb inside their stick, or the USB port. Or the alignment of the moon. I’m pretty meh on this existing in arcade form. On one hand, it’s the best way to play sf. In person, in a noisy environment, with onlookers cheering on good/bad play. But, this game is so damn boring that I dunno why anyone would bother. I do like the orange scheme though. I mean, orange doesn’t match the theme (lol as if it even really has one) of the game though. Wouldn’t gold make way more sense?